Bend perspective to match your vision. For the storytellers who bring us reality-bending views of landscapes, cityscapes, architecture and fine art, the realm of possibility just got wider. For the first time with a NIKKOR PC lens, the direction of tilt operation can be made parallel or perpendicular to shift*, allowing you to control perspective, focus and depth of field like never before. Tilt to create scenes with selective defocus (miniature effect) or sharp focus throughout the scene. Shift to control the effects of keystoning and fix issues of perspective in-camera. In photography or filmmaking, the PC NIKKOR 19mm f/4E ED can help you create images as unique as your creative vision. *Depending on the combination of shift and rotation, operation may be restricted by mechanical interference between the lens and the camera. As an ultra-wide-angle lens and a perspective control lens, the PC NIKKOR 19mm f/4E ED has to work double duty combating distortion and glare. And does it ever. Three Extra Low Dispersion (ED) glass elements and two Aspheric glass (AS) elements virtually eliminate chromatic aberration and coma, even at the widest aperture setting. Nano Crystal Coat (N) increases backlight tolerance for clear images with minimal ghosting and flare. Like all NIKKOR lenses, image quality comes first with the PC NIKKOR 19mm f/4E ED. A 19mm angle of view on FX cameras is very similar to the angle of view prized by many large- and medium-format photographers. This sweeping, ultra-wide perspective is ideal for landscapes, cityscapes, interiors, architecture, horizontal or vertical panoramas and filmmaking, and it gives you a broad, versatile brush with which to paint your images. For the first time, a NIKKOR lens can be tilted and shifted independently and then rotated up to 90°. Tilt to control the plane of focus—creatively or precisely, the choice is yours. Shift to control perspective or create panoramas. Shift operation no longer requires locking and unlocking—smoothly and seamlessly make adjustments. What thrilling new views will you discover? The new PC NIKKOR 19mm f/4E ED joins other PC NIKKOR lenses in the Gold Ring Series, which include only PC NIKKOR lenses with Nano Crystal Coat and pro-grade build quality. These other lenses include the PC-E Micro NIKKOR 45mm f/2.8D ED, PC-E Micro NIKKOR 85mm f/2.8D, PC-E NIKKOR 24mm F3.5D ED. An anti-reflective coating developed by Nikon that virtually eliminates internal lens element reflections across a wide range of wavelengths. Nano Crystal Coat uses ultrafine, nano-sized* crystal particles to eliminate reflections inside the lens throughout the spectrum of visible light waves (380 to 780 nm) in ways that far exceed the limits of conventional antireflection coating systems. Nano Crystal Coat not only solves ghost effects caused by red light, which was incredibly difficult for previous systems. It also effectively reduces ghost and flare effects caused by light entering the lens diagonally. The result: clearer images. The lens incorporates an electromagnetic diaphragm mechanism. The following cameras are compatible with this lens:D5, D4 series, D3 series, Df, D810, D810A, D800 series, D750, D700, D610, D600, D500, D300 series, D7200, D7100, D7000, D5500, D5300, D5200, D5100, D5000, D3300, D3200, D3100. 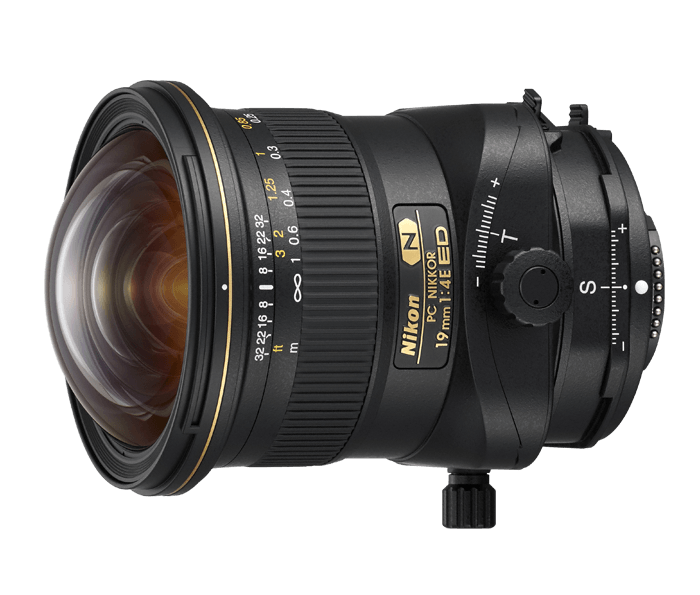 There are limitations in compatible cameras when using the PC NIKKOR 19mm f/4E ED. Models that can be used without any limitation: D5, D4 series, D3 series, D810 series, D500. Usable models although there are some limitations: Df, D800 series, D750, D700, D610, D600, D300 series, D7200, D7100, D7000, D5500, D5300, D5200, D5100, D5000, D3400, D3300, D3200, D3100. Incompatible models: D2 series, D1 series, D200, D100, D90, D80, D70 series, D3000, D60, D50, D40 series, film cameras, Nikon 1 series with the FT1. Rotates 90° left and right with stops every 30°; tilt mechanism rotates 90° left with a stop at 45°.